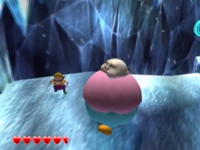 Fattingtons are morbidly obese enemies resembling ice cream that Wario comes across in Wario World. They appear in the Shivering Mountains. Due to their round body, Wario's punches have no effect on them; punching them, or merely touching them, causes Wario to bounce back. To defeat them, Wario must grab a Column, Sculpture or another nearby enemy such as an Icicle Mite and throw it at the Fattington. Wario can then pick up the Fattington and use a Mad Move to defeat it. ↑ Stratton, Steve. Wario World Prima Official Strategy Guide. Page 14. This page was last edited on August 31, 2018, at 09:41.